Joshua Tieman (pictured right) only needed four hours to dispose of his opponents at the final table to win event No. 6 ($5,000 No Limit Hold’em Shootout) at the 2010 World Series of Poker. Tieman took home his first bracelet and $441,692. 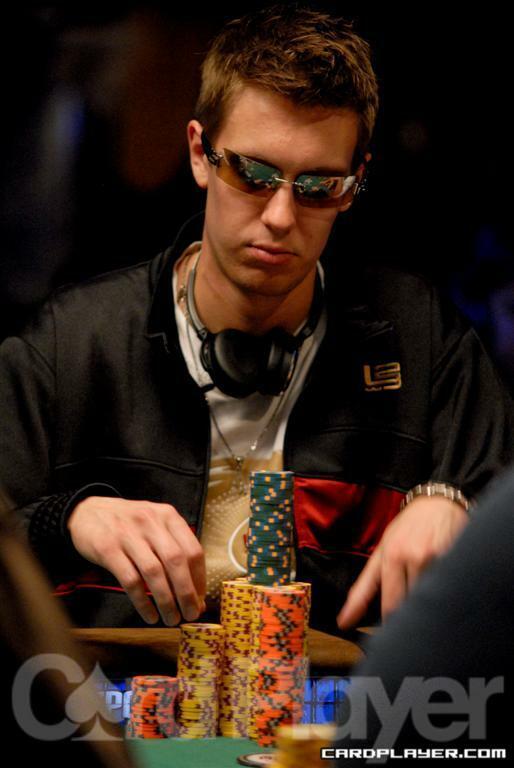 His highest finish at the WSOP before this win was third place in event no. 46 ($1,500 no-limit hold’em) in 2006. There were 358 players who registered for this event. They built up a prize pool totaling $1,682,600. The field played on 36 tables during day one, and each table winner walked away with $16,607. Notables who won their first table included Tom Dwan, Max Pescatori, Faraz Jaka, Justin Smith, Chad Brown and Dario Minieri. The final table started fast as Brent Hanks was the first casualty of the day just an hour into play. Hanks also had the distinction of being the only player at the final table not to be eliminated by Tieman. Nicolas Levi was the next to go just a few hands after Hanks, courtesy of Tieman’s set of eights. Tieman knocked out the next two players and had a 7-1 chip advantage on Neil Channing when heads-up play began. It took only a few hands for Channing to find himself all in against Tieman. Channing held A 7 , but like the rest of Tieman’s victims, Channing found himself dominated by Tieman’s A J . Tieman made a broadway straight on the hand and took down the tournament. Brent Hanks raised to 60,000 from the small blind and Nicolas Levi raised to 160,000 from the big blind. Hanks moved in for 600,000 and was called. Hanks turned over A Q while Levi showed 7 7 . The board ran out 9 9 5 7 3 and Hanks was eliminated. Joshua Tieman raised to 60,000 and Nicolas Levi reraised to 189,000 from the big blind. Tieman put in one more raise and then Levi moved all in. Tieman called and turned over 8 8 . Levi showed J J and was poised to double up. However, the board ran out 8 5 4 A 2 , giving Tieman a set on the flop and Levi was out. Joseph Elpayaa found himself all in against Joshua Tieman. Elpayaa turned over A J and was trailing Tieman’s 10 10 . The board ran out 7 6 3 5 10 and Elpayaa made his exit in fourth place. Stuart Rutter raised to 68,000 from the button and Joshua Tieman raised to 185,000 from the big blind. Rutter then popped it to 500,000. Tieman raised that bet to 2 million, to which Rutter replied, “All in.” Tieman made the call and turned over A Q , dominating Rutter’s A 10 . The board ran out Q 7 3 A 3 and Rutter was eliminated. Joshua Tieman steam-rolled his way to a massive chip lead once the final table got to heads-up play. Neil Channing decided to make his stand moving all in preflop holding A 7 . Tieman made the call once again, and once again he was dominating his opponent holding A J . The flop came down K 10 4 , giving Channing no help. The turn was the 10 , pairing the board and giving Channing some outs. He needed to a king or a four to chop the pot or a seven to win it. But the river was the Q , giving Tieman a Broadway straight and the victory.